This is a guest post by my dear friend and business partner, Ken Davis. He’s also one of the best public speakers you will ever hear. You can also read his blog and follow him on Twitter. If you want to guest post on this blog, check out the guidelines here. Listen to most presentations and you will hear a litany of stories half submerged in what might be major points—or maybe just another story. Regardless, 75 percent of the people leave a presentation with no idea what the point of the message was. Even worse, 50 percent of speakers can’t identify the objective of their own talk. Effective communicators know how to prepare a message with a singular and crystal clear focus. If you know where you are going, you can take anyone with you. Effective communicators know how to read an audience and are able to customize their presentation to make that audience want to listen. Until the audience is engaged, communication has not taken place. An engaging presentation puts people on the edge of their seats. Effective communicators are passionate about their subject. They pour every part of their being into the presentation. If the subject is not worthy of your passion, it should be distributed in a memo. Effective communicators leave the audience no doubt about how to benefit from the objective of the talk. They call people to action. They make it easy to respond. No secrets there! Most people want to do all the above but don’t know how. I developed the SCORRE System™ to teach people how to develop all the skills above. I may be biased, but the response of people who have attended indicates that if you want to be a dynamic communicator, The SCORRE Conference is the best investment you can make. Thousands of men and women including writers, professional speakers, CEOs, ministry professionals and sales and marketing executives have learned to prepare with focus, deliver with clarity, and speak with power. I hope you will become one of them. Michael here again. 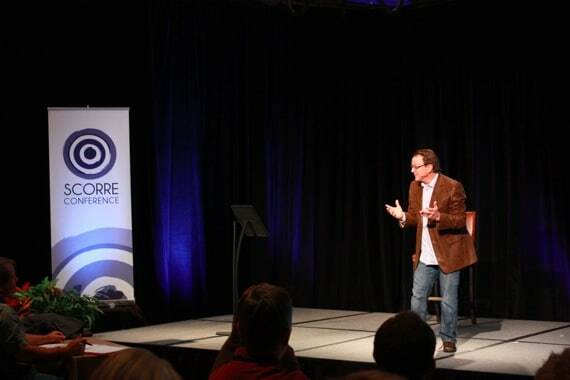 The next SCORRE Conference will be held in Vail, Colorado, October 17–20, 2012. We will begin the official promotion next week. However, I talked Ken and my team into making a special, pre-promotion offer to my readers. Here’s the deal: The registration fee for the conference is $1,497. The “early bird price” is $1,397. However, if you register any time before Monday, May 14th at 5:00 p.m. CDT, we will give you another $100 off, making the total price just $1,297. Note: This conference will sell out. If you want in, you need to take action NOW. We are already getting calls and e-mails from people wanting to reserve a spot. Our last conference sold out in less than a week! Don’t miss this opportunity. This is your chance to take your speaking and communication skills to the next level. To take advantage of this special offer, register with the coupon code HYATT. By the way, you take ZERO RISK. If you attend the conference and don’t feel the investment was worth every penny you paid, we will happily refund your full registration fee, no questions asked. Also, Ken and I will both be there. In addition to teaching one of the sessions, I will be present for the whole conference, interacting with the students. So will Ken. Update: here are some video testimonials from students. Question: What would better communications skills make possible for your career? You can leave a comment by clicking here.